The town of Nafplio, in the Peloponnese, Greece, is a place the Gods smile upon. An aura of decaying antiquity haunts the Old Town, a breath of crass modernity pervades the New, and the Gods hang around just to see what the tourists are going to do next. From Nafplio, I was interested in visiting Tiryns, the ruined Mycenaean citadel (1,400 BC), situated four kilometers away. It was purported to have awesome walls, constructed of massive stone blocks so large only the giants known as Cyclops could have built it. 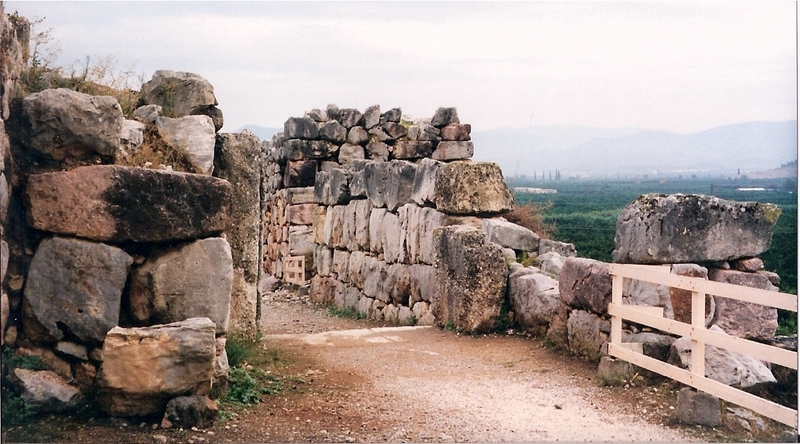 In its heyday, Tiryns co-existed with powerful Mycenae — some say it was the port for King Agamemnon’s mighty fortress. Indeed, legend said Heracles (Hercules) was born at Tiryns. At the Nafplio bus station nobody seemed to worry much about Heracles. It was with some trepidation that I boarded the Argos bus in the vain hope the driver would take pity on a daft tourist and deposit me somewhere near the ruins. As luck would have it, he stopped the bus right by the site. “Tiryns,” he announced in a voice like the prophet of doom. I was not the only person to disembark. Two young German students followed me. In the way of the uncertain, we joined forces to find our way, for although we had seen the site as we drew near, the entrance was not readily visible. Walking up a short road, we were blocked by a large gate. What we took to be a small ticket booth stood at one side, manned by a very burly, nasty-looking individual who did not understand our polite enquiries in either English or German. The young people showed him their student cards and explained that their interest in Mycenaean ruins was to further their architecture studies. I told him how I was interested in the siege of Troy and King Agamemnon, whose citadel at Mycenae I wished to compare with Tiryns. We all had our money ready for the entrance fee and tried to give it to him, but he refused to have anything to do with us. With a torrent of angry Greek, he pointed down the road and turned his back on us. Ah, ha! After following this side road, we could look back to where we’d been. We could now see a sort of quadrangle with square towers at each corner, high stone walls decorated with broken glass and barbed wire. It was then, with awful certainty, that we realized we were looking at a jail, and we’d been trying to get IN! 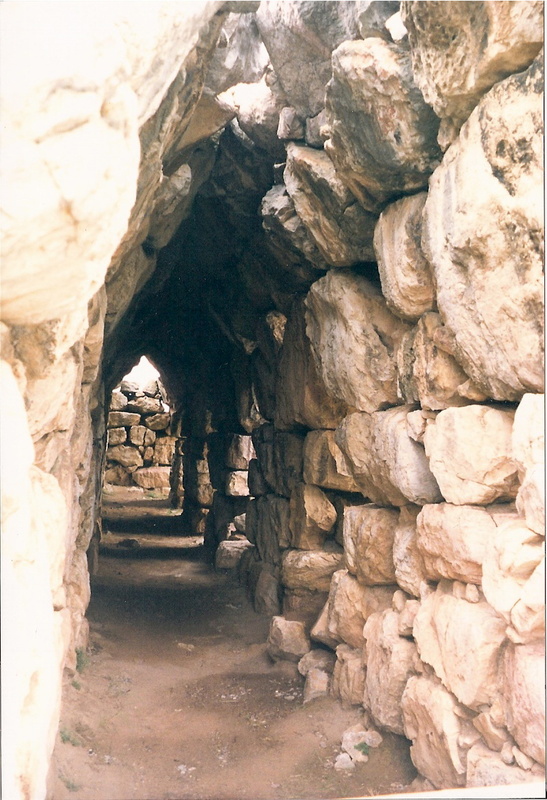 The three of us laughed all our way around the awesome ruins of Tiryns, through the encircling walls — huge great blocks of grey stone thirty feet high in places — and through interesting storage galleries and chambers. Maybe the ghost of Heracles appreciated the joke, for there was just the faintest echo of laughter from one of the gloomy vaulted arched galleries. Daft tourists! To get there: Take a bus from Athens to Nafplio (several runs daily, 2 1/2 hours each). Then, from Nafplio, catch a bus towards Argos and ask to be let off at the Tiryns site. Travel Tip: Try to spend at least two nights in Nafplio, more if you can, and use it as a jumping off point for Corinth, Argos, Epidavros and Mycenae. Superb evening ambience in the old Venetian streets.